Kerala Fish Fry. What a fish wonder (Tuna Cutlets, Hong Kong Steam Fish & Stingray Spicy Sauce) and if we are talking about frying this Kerala fish fry, so easy. Really. I mean what are ready made spices for? Ready made spice powders you can easily buy and? Let's get frying. I say none further. Fish marinated alongside coriander powder, fennel powder, cumin powder, fish curry powder, lime juice and curry leaves, and fried till crispy on the outside and juicy inside. 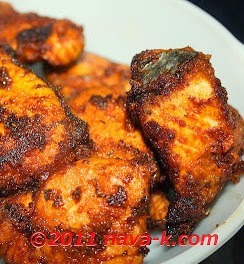 Of course, Kerala Fish Fry, like I have already told is the Kerala fish wonder. Simple irresistibly when paired with rice and other side dishes (Chilli Soy Fish, Fried Kembung Assam Sauce, Assam Curry Fish & Malaysian Indian Fish Curry). Of course, Kerala style meaningfully. Marinated fish with all the ingredients. Keep aside/leave in the fridge for about 1 to 2 hours. Bring out and deep fry. Alamak...paiseh...I have yet to try out your other fish recipi. Now feel like eating this dish pulak. Tamak. 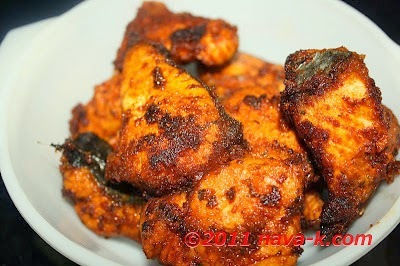 I loved fried fish and what a plus with all those spices used and spicy! Ann - thats really humorous. To the rest, appreciate all the wonderful comments. Beautiful color. I love the mix of spices. Appreciate all the lovely comments everyone.